Make a tax-receiptable donation today to support the Salish Sea Marine Survival Project, your donation will be matched by Rudy North and you will be entered to win one of two great prizes! Past studies of the Salish Sea have focused on individual species in specific places at a specific time. The Salish Sea Marine Survival Project seeks to study the interaction of all these species and environmental factors, and how they interact to affect salmon. But how do you study such a vast and constantly changing environment without limitless resources and funds? Our solution is to empower volunteers as researchers. Donors to the Project can expect 4:1 leverage thanks to donations of special equipment, labs, expertise and time from the Project's more than 30 different partners. Donate now and help restore this beloved fishery to its former glory. The Frederickson family operate the Qaulicum route. 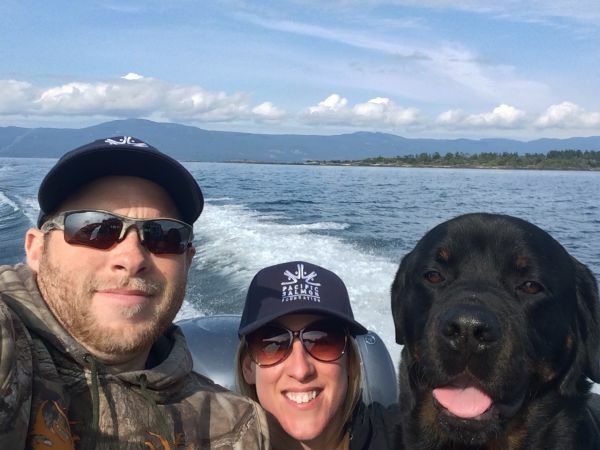 From left: Ryan, Nicole and pooch, Hunter. The Salish Sea Marine Survival Project is a joint US - Canadian initiative with the Pacific Salmon Foundation leading on Canadian research and restoration efforts in the Strait of Georgia. Seattle-based Long Live the Kings is leading on efforts in Puget Sound and the Strait of Juan de Fuca or the U.S. waters of the Salish Sea. The Project's Citizen Science Program is based on the concept that regular citizens can play a valuable role in scientific research. The program engages volunteers with boats who each monitor nine interlocking areas of the Strait of Georgia (Canadian waters of the Salish Sea) and collect key data on ocean conditions and species. This summer, the Program began engaging passengers on BC Ferries in answering a vital question: How does light affect the ocean's organic and inorganic matter? The Citizen Science Program is one of 33 different initiatives through the Salish Sea Marine Survival Project targeted at restoring the Strait of Georgia fishery. The fishery has declined by about 90% for wild Coho, Chinook and Steelhead in the last 20 years. While satellite surveillance and water testing is being undertaken to understand the productivity of the Salish Sea and the health of salmon, the University of Victoria's Remote Sensing and Spectral Lab uses sensors installed on BC Ferries' Queen of Oak Bay, which shuttles passengers between Horseshoe Bay and Nanaimo. 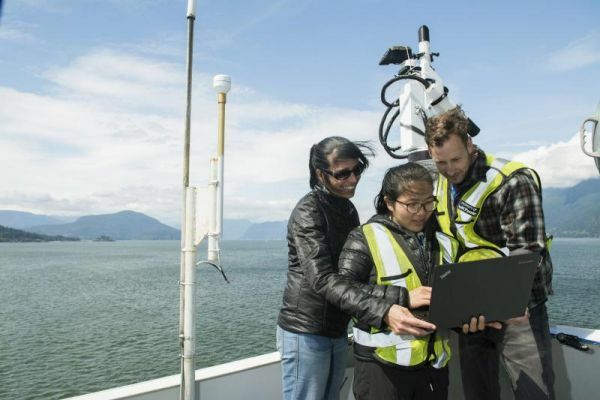 Professor Maycira Costa, who developed Spectral, explains: "We got the idea to use BC Ferries passengers to help us collect data, via tablets with an app that guides users on how to take photos of the sea and sky and calculates the light reflection in the process – that information informs us about ocean productivity and turbidity (water murkiness)." 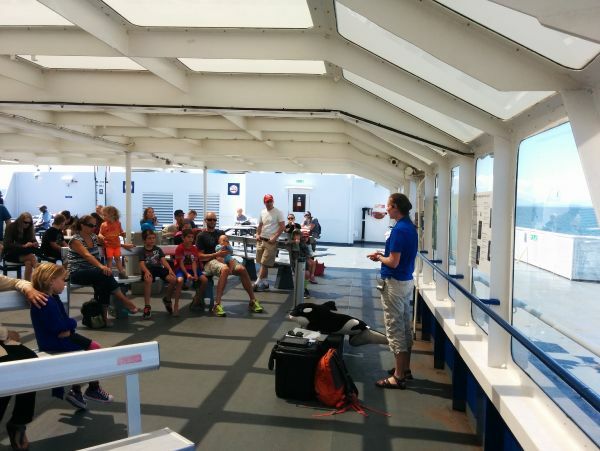 Coastal Naturalists educated passengers on the program. 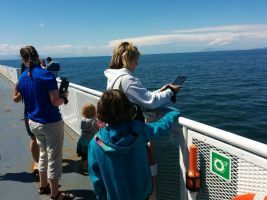 "This summer, a Coastal Naturalist presenter shared with passengers information about the ocean and what our research is about; then she distributed the tablets, and off the passengers went to snap photos of the ocean." Their enthusiasm has prompted Spectral to consider engaging passengers again next spring. Says Costa, "It's a great way to foster environmental stewardship – as well as advance our understanding of light in coastal waters." Thanks to donors, the Pacific Salmon Foundation has attracted 80% of the $10 million budget through major donations. This five-year project will be starting it's fourth year in 2017. But we need to continue raising $450,00 annually to keep the Project moving at full speed.Please consider making a year-end tax-receiptable donation to help keep this landmark project going...and remember you donation will be matched dollar for dollar!